« No mega-port for Cairns e-petition – sign now! 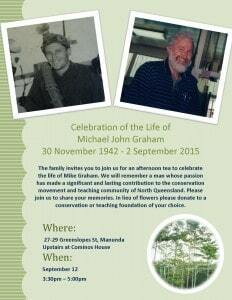 The family invites you to join us for an afternoon tea to celebrate the life of Mike Graham. We will remember a man whose passion has made a significant and lasting contribution to the conservation movement and teaching community of North Queensland. Please join us to share your memories. In lieu of flowers please donate to a conservation or teaching foundation of your choice.